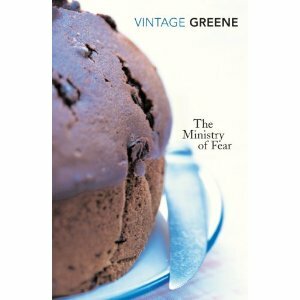 Set during the time of “The Blitz”, Ministry of Fear, is a mystery / thriller novel written by the British author Graham Greene. Arthur Rowe, a man probably in his late forties (it is purely my assumption, might be a detail I've missed out on, while reading), attends a fête, where he consults a fortune teller, who tells him to guess the weight of a cake, at a raffle which was being conducted at the fête and tells him the exact weight. Rowe does so, and wins the cake but from that moment, he is a hunted man and an attempt was made to poison Rowe at his own residence and retrieve the cake but, at that juncture, Rowe's house is destroyed by a bomb, due to an air-raid and the cake was gone, along with his house. Rowe wanted to follow this up and find out why some people are desperate for the cake. Little did he realise that he was just sending an open invitation to “danger” by doing so and probably, Rowe's only advantage is that, he himself has a shady past and is a murderer himself. During the course of the plot, Rowe is also charged with a murder, committed during a séance and evidences are against him. He goes into hiding, still desperate to uncover the mystery behind the cake. Giving out any more details would make this review a spoiler. Greene has to be appreciated for the complex character which he has created in Arthur Rowe. A man with a shady past and with an excessive sense of pity for a protagonist, would put the reader into a dilemma, on whether to side with Rowe in his endeavours or not and in most cases, it is not likely to be the latter. Greene also brought out Rowe's character in a very interesting way, in the chapter, “Between Sleeping and Walking”. It was different, unlike most books, where, the protagonist's character is just brought out in one paragraph. The plot, throughout, was moving in one direction, something which should certainly be appreciated in a thriller. Another highlight of this book is the description of the war-torn city of London. In a thriller novel, a reader can't trust any character, anyone might betray the protagonist at any time and this novel is certainly not an exception to this clichéd definition. Moreover, Greene definitely would have to be credited for making a big issue, 220 pages long, to be precise, out of a meagre cake. However, this novel is far from being perfect, despite the high amount of positives. Although the novel largely maintained a good pace, like a usual thriller, the second book of the novel, “The Happy Man” was like a road hump, and nearly looked like a sub-plot. Although the content of that book was definitely essential to the story, I found it a little boring. One might realise that sometimes, in this book, the coincidences that occur in this novel crosses the break even point for the line “believable”. Certain incidents were left unexplained, which ended up creating some lose ends. The book definitely had a good plot, but I don't think it was presented in the best way, and thus, reading this book might not be an experience which gives pleasure. The book certainly has a lot of positives and in fact, I've hardly listed out so many positives in any of my other book reviews. But, the only reason why most people read works of fiction, particularly in this genre, is to enjoy and so, obviously, the rating would be pulled down for the very fact that I didn't really enjoy reading the novel. I'd say that, this book, in some areas is extremely good and in other areas ; I would not like to use the superlative, but would just end my description with a simple adjective, bad. I shall prefer sitting on the fence, when question of rating the book arises and I shall award this book a “neither here nor there” kind of a rating. "The whereabouts of King Solomon's legendary diamond mines has been inscribed in blood on an ancient map now in the possession of Allan Quatermain. His enthralling story begins on a ship steaming up the east coast of Africa. On board he meets Sir Henry Curtis and Captain John Good, and agrees to join their search for Curtis' younger brother, missing, believed dead, in the interior. Aided by the treasure map, the men set out on a perilious journey, an adenture tense with danger and excitement that culminates in a mountain trek to the vast caves of Solomon - and what they find there." King Solomon's Mines is a novel written by Sir Henry Rider Haggard, more than a century ago. Despite this time gap, this novel is still very popular. So, out of curiosity, I decided to read this work of fiction so that I could figure out why it is still so popular. So, I borrowed the book from a library in 2009, but being a slow reader, I couldn't even complete half the book within the given time. However, it did enough to grab my attention and eventually, after searching in book-stores for nearly two years (readers have lost interest in classics these days, unfortunately), I finally got a paperback edition of the novel and managed to complete the book. Sir Haggard wrote this novel as a result of a five-shilling bet with his brother, saying he could write a novel better than Robert Louis Stevenson's Treasure Island. So, naturally, King Solomon's Mines is also an adventure story, with three men going in search of someone and something. Sir Henry Curtis and Captain John Good approach an old elephant hunter who lives in Durban, Allan Quatermain. Curtis' brother, George, had been missing and was requesting Quatermain to join their quest. Quatermain did have some information on Curtis' brother, that he had gone in search of Solomon's Diamond Mines. Quatermain has an old map, for which, an Portuguese explorer, Jose Silvestra is the cartographer. Silvestra lived around three-hundred years ago and Quatermain had acquired the map from his descendant. Curtis and Good, initially found it hard to believe but the former decided to have faith in Quatermain's story as by doing so, he has some chance of finding his brother. Quatermain agreed to help the two after Curtis had agreed to honour all of Quatermain's conditions. They hire a native servant, Umbopa and set out on this journey. Quatermain is the narrator and writes about his adventure as a story for his son to read.
" 'A sharp spear,' runs the Kukuana saying, 'needs no polish' ; and on the same principle I venture to hope that a true story, however strange it may be, does not require to be decked out in fine words." It was fast paced and the events were very well described. I loved the author's language. Although this is a very serious novel, the author brought in some occasional humour with the character of John Good. While one could say that Good was quite unnecessary, his presence in the novel added more dimensions to the story as there was also a minor, romantic sub-plot between Good and a native woman. Another aspect of the book for which the author has to be appreciated for is for the fact that the book hardly digressed from the main purpose and Quatermain himself, cuts out several unnecessary events(as mentioned in the book). However, in modern times, one might not agree with how the natives were portrayed as barbaric and aggressive (although, there were also some noble natives like Ignosi, Infadoos and Foulata). Quatermain's occasional comments showed that he was a racist. But Haggard can't be blamed much as it was probably how things were when the book was released, 1885, that is. I found the excessive use of old words such as “thy, thou, thee, etcetera” to be annoying. The natives of the lost world may have spoken an ancient form of Zulu, but Quatermain, merely translating them, need not have used such words. The only major downside of the book being that, the element of suspense was completely lost. The reader knows that the events that the narrator is mentioning is over, and he is able to mention them only because he is still alive. So, whenever Quatermain was caught in several situations where death was nearly certain, the reader knows that he'd somehow come out of it for he is still alive. On the whole, I thoroughly enjoyed reading this book and I have realised why this book is still famous and I'm sure that this book will continue to remain famous for several generations to come. Further more, in my opinion, Henry is the obvious winner of the bet although I'm not sure whether his brother accepted it. Anybody interested in adventure stories will certainly enjoy reading this book. I shall gladly give this beautiful work of fiction an eight on ten. In case you, the reader of this review, decide to read this book after reading my review, I hope you enjoy reading this book.